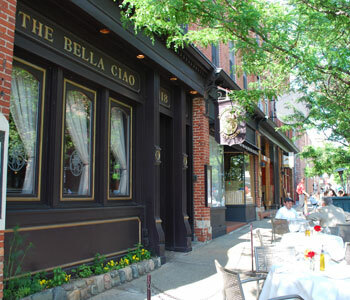 June 20 will be the last day of service at Bella Ciao restaurant on West Liberty. On any given night when the weather allows, you’ll usually find James Macdonald chatting with customers or passers-by at his West Liberty restaurant, Bella Ciao, as servers shuttle in and out of the building to serve outdoor diners. But not for much longer. After running the restaurant for over 22 years, he and his wife Kathy Macdonald are selling the business to local chef Brandon Johns, who plans to transform it over the summer into an eatery that highlights food from local farms and markets. Bella Ciao will remain open through the upcoming Ann Arbor Restaurant Week, an event spearheaded by James Macdonald that highlights downtown restaurants and features set-price lunches and dinners. Bella Ciao’s last dinner service will be on Saturday, June 20. Johns, with his wife Sara Johns and two business partners, plan to renovate the restaurant and open it in early August as Grange Kitchen & Bar. The deal closed earlier this week. Kathy Macdonald made the announcement at Thursday morning’s membership meeting of the Main Street Area Association, which The Chronicle attended. In a phone interview later in the day, she said they plan to focus on their other local business, Pastabilities, a pasta wholesaler that sells to area groceries and chefs. She said they’ll be selling off most of Bella Ciao’s extensive wine list as well. “There’s only so much we can bring home,” she said. Until recently, Johns was a partner and head chef for Vinology on Main Street, which he had joined in May 2008. In a statement posted on the Vinology website, Johns said, “It was pretty clear after being there a year that I simply wasn’t going to get the support I needed for the concept I had created. I know the community was behind my local sourcing efforts, but I was only a minority owner and didn’t have the full backing I thought I had coming in a year ago.” On Thursday, Sara Johns told The Chronicle that Rob Cleveland, also a former partner with Vinology, is now a partner in this new venture, along with another local investor who Johns said has asked to remain anonymous. Vinology co-owner John Jonna, at his restaurant Thursday evening, told The Chronicle that he wishes Johns all the best, and described him as an excellent chef and a hard worker. He declined to comment further on the situation, saying that Vinology will continue doing what it’s been doing – providing excellent food and service to customers, and adjusting to their needs. A sign posted on the restaurant’s door states that Vinology is ending its lunch service as of June 8 – Jonna said the lunch business wasn’t strong enough to make it worth staying open during those hours. As The Chronicle reported last year, Brandon Johns is an advocate for local food sources. He is a member of Slow Food Huron Valley and has cultivated relationships with local farmers and other food producers. The new restaurant will “go all the way with farm-to-table dining,” said Sara Johns, who handles marketing and communications for the business. The menu will feature seasonal offerings, she said, and homemade items like pasta and preserves. Brandon Johns also likes to use the entire animal in his cooking, she added, so in addition to more traditional fare, diners can expect to see dishes made from bone marrow, pork bellies and veal cheeks, for example. Grange Kitchen will occupy the entire three-story building at 118 W. Liberty, which the MacDonalds own. They’ll use the third floor as an office, the second floor as a bar with a limited menu, and the first floor as the main dining area. They’ll remodel over the summer, taking out Bella Ciao’s Old World-style decor and opening up the space, creating a lighter, more accessible feel, Sara Johns said. She acknowledged that this economy is a difficult one for restaurants to survive, and said they’ll be watching their dollars closely. They plan to keep remodeling costs as low as possible – she said they don’t yet know how much they’ll invest in that – and keep their menu priced to be accessible to a wide range of diners, not just the fine dining crowd. Kathy Macdonald said they’d been looking for a buyer for a long time, hoping to sell the business to another chef. So when Brandon Johns and his partners approached them earlier this year, “of course James’ eyes lit up,” she said. They structured a deal so that no bank loan is involved – the Macdonalds will be paid back over time, she said, adding that the downside is if Johns and his partners can’t pull it off, “we’ll be back in the restaurant business.” The purchase price was not disclosed. Sara Johns said she expects her daughters – 7-year-old Alice and 10-year-old Lily – will be fixtures at the new restaurant. Kudos to the Johns & team. Sounds awesome! Can’t wait for it to open and to work with them! I wish the new venture success, but I will very much miss the warm welcome from James, his going around to every table to talk with the patrons, and, of course, the the top-notch food and wine. I regret not going there more often. I remember a particularly amusing evening when the candles on a cake celebrating the birthday of a certain former City Council member set off the smoke detector upstairs! Glad that James will still be in town. What appeared to be another sad headline is actually great story. One delicious landmark AA restaurant transitions into what will certainly be another! Best of luck to the both families. Can’t wait to taste that local flavor, Brandon! As a former waiter at Bella Ciao, I’m sad to hear that the restaurant is closing. Jim is as kind an employer as he is gregarious a host, and I still remember with affection the ‘family meals’ the staff enjoyed before service each evening. I wish all the best to Grange Kitchen, but I’ll miss saying hello at ‘the Ciao’ on visits back to Ann Arbor. I second Rena’s comment. The Bella Ciao was a great Ann Arbor landmark, but I’m expecting that the new Grange Kitchen will be another. It’s great to see Chef Johns’ commitment to the community benefits of farm-to-restaurant eating. All the best! I’ve known Chef Brandon for years…this restaurant is YEARS in the making. I am so happy that he will finally get a chance to showcase his amazing talents.